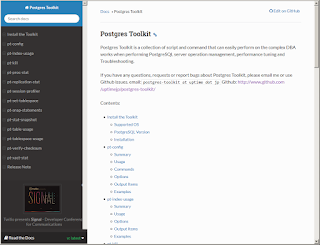 ■What does Postgres Toolkit contain? pt-index-usage Show index usage, including index size, tuple/block access statistics, timestamp of vacuum/analyze, and tablespace name at once. pt-kill Send signal to a backend to cancel a running query or to terminate the backend safely. pt-proc-stat Show status and process statistics, including disk I/O and network I/O, of each process in the PostgreSQL instance. pt-replication-stat Show status and statistics of master and slave node(s) at once, which a replication cluster consists of. pt-session-profiler Show queries, which exceeded specified elapsed time, by capturing network traffice and analyze it. pt-set-tablespace Change tablespace for multiple tables and releted indexes at once. pt-snap-statements Show statistics of queries which ran in the specified period of time. pt-stat-snapshot Take snapshots of several statistics which can be obtained in PostgreSQL, and manage them. pt-table-usage Show table usage, including table size, tuple/block access statistics, timestamp of vacuum/analyze, and tablespace name at once. pt-tablespace-usage Summarize tablespace usage per database, and show them with available space size of the partition. If you want to try the latest code under development, please obtain from the github repository. In the following posts, I'm supposed to introduce how to use each command in the Toolkit. 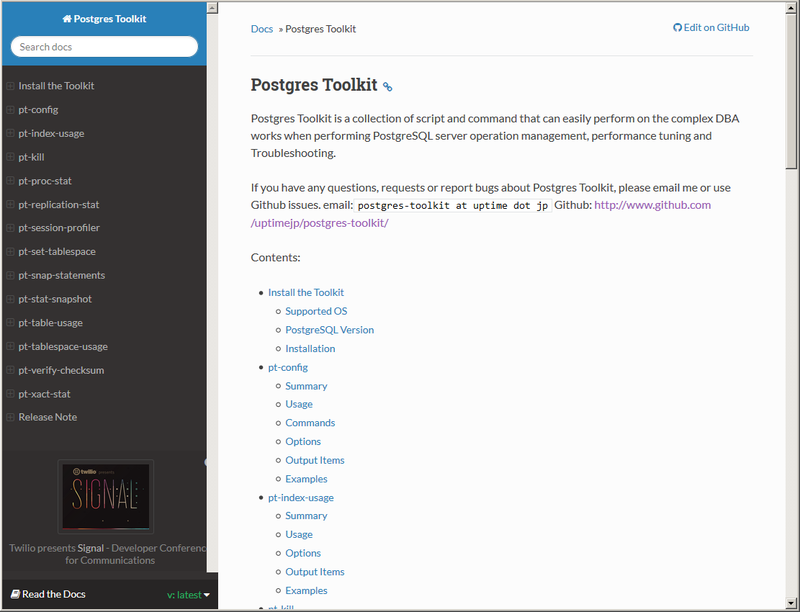 If you are using and managing PostgreSQL, please try this toolkit, and send me your feedback. I think this toolkit can help you in some cases of your daily operations. I welcome your feedback via e-mail, postgres-toolkit at uptime dot jp, or on our Github Issue, or comments on this blog. I know Postgres Toolkit can be (and needs to be) improved and enhanced in the near future, but it also needs any kind of your feedback. So, please try it and please send me your questions, thoughts and ideas. For the wget installation you really should use https. I will setup https asap. Indeed. The prefix is a bit confusing for some people. But I think it could be OK to install in the different directories if you want to install both on one box. AFAIK, pt-query-digest does support only server log files for PostgreSQL. Right? pt-session-profiler can capture and analyze the PostgreSQL wire protocol with tcpdump. Anyway, thanks for your feedback again! I want to learn more about how to improve productivity and quality of our DBA work! As to the name collision - it's likely that a DBA who has to support all the things that have been installed over the years in any legacy environment will have to deal with both PostgreSQL and ... other databases. If I could specialize to just PostgreSQL, that would be ... amazing. The default PostgreSQL prefix for tools is pg_. How about moving to pgt_ for postgresql toolkit? These are useful tools - however these would be much nicer in a package. also...there is no 'uninstall' currently that I see. being a redhat world, why did you pick /opt ? default path'ing...etc could be taken care of. also dep solving could be taken care of with packages. > The default PostgreSQL prefix for tools is pg_. How about moving to pgt_ for postgresql toolkit? It's considerable, but I'm afraid that such 3-letter prefix is a bit bothersome. 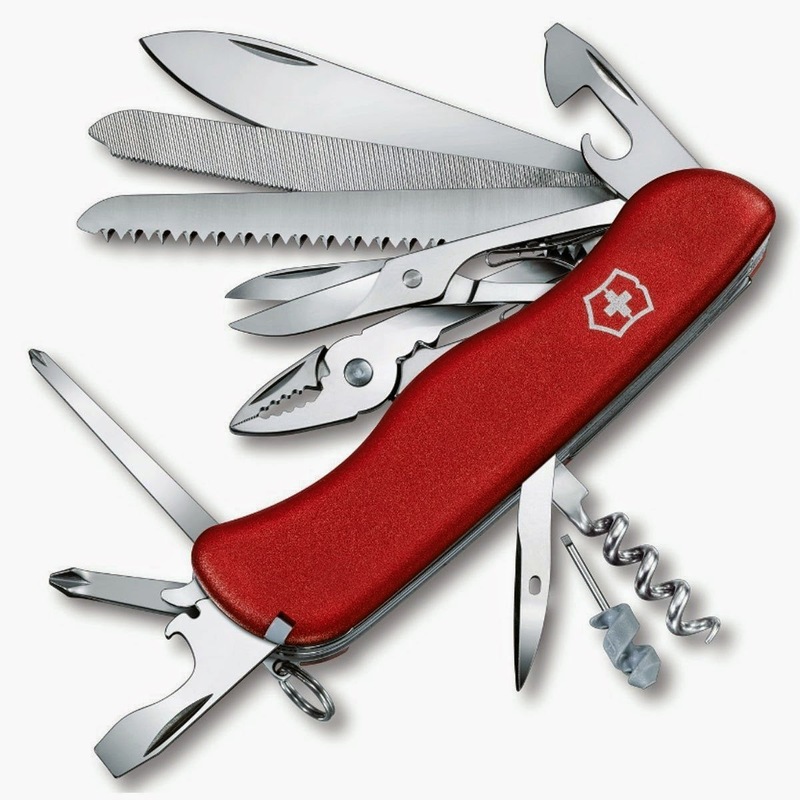 > These are useful tools - however these would be much nicer in a package. > also...there is no 'uninstall' currently that I see. > being a redhat world, why did you pick /opt ? I just started considering building a RPM package and following the Red Hat's path'ing. The toolkit may be also provided as a RPM package in the future release. Since you're doing packaging anyway, perhaps a build option for prefix? gnu tools used to have to do this to avoid collision w/ (usually broken) system binaries, hence gawk and gmake. Hi Satoshi, cool tools and thanks for making them available. In my machine (Ubuntu 14.04) I have Python 2.7, I see that the Python version used has been 2.6. Every time I try to run one of the tools I get '/usr/bin/env: python2.6: No such file or directory'. Most likely this code can run on Python 2.7 (correct me if I'm wrong). So my question is: is there a way to point to other path whether Python is installed? Thanks! Now, I'm working on that to support Ubuntu. Please visit the issue (and the branch) on Github. asap after passing the regression tests with other major versions. If you want a quick try with python2.7, you can replace "python2.6"
with "python2.7" in every scripts by yourself. And it would work. Following the instructions from the link you provide everything is working fine.